Worcester County Sheriff Lew Evangelidis announced he has promoted Lieutenant Michael O’Neill of Charlton to the rank of Captain. “The Worcester County Sheriff’s Office is pleased to announce the promotion of Lieutenant Michael O’Neill to the rank of Captain. Captain O’Neill will immediately begin serving in this important role and leadership position at our correctional facility. All promotions at the Worcester County Sheriff’s Office are based on merit, work ethic and a dedication to duty. Congratulations to Captain O’Neill as he represents the best in the field of corrections today and will work hard to make us a better department,” said Evangelidis. 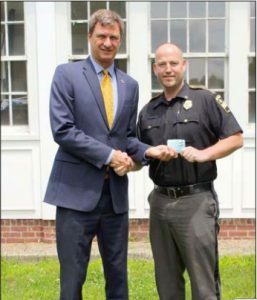 O’Neill, a 13 year veteran of the department, started his career with the Worcester County Sheriff’s Office in September of 2005, was promoted to Sergeant in January 2015, Lieutenant in 2017 and most recently to Captain. Captain O’Neill, who served in the special management unit, will continue to be assigned to the main jail. He will be responsible for commanding and supervising lieutenants, sergeants, correctional officers and staff under his charge as well as monitoring the care, custody and control of inmate activity ensuring the safety of both staff and inmates.